Why is great SEO so important for your photography business? If people can’t find you, they can’t hire you. SEO, search engine optimization, helps people find your photography business. If you have been listening to my podcast or reading my posts lately, you know I have been discussing SEO regularly. SEO is fresh on my mind because it has been super important to me as I work on promoting my new business, Nifty Knowledge Rocks. In Podcast #13 – SEO Juice for Photographers, I discussed the whole “be everywhere” mentality. But I didn’t touch on all of the specific things that make for good SEO. Why? Because I am not an SEO expert…more on that in a little bit along with the SEO COOKBOOK. But first, I want to share some information about my personal experiences with SEO. I have been doing a ton of research online, reading information from SEO resources that I trust. I have been implementing these techniques with great success and in just a few short months I have brought this blog from a few page views by a few visitors to thousands of page views by thousands of visitors! I provide a ton of value through the NKR blog, podcasts, and YouTube videos, but within this content, there is some SEO magic. I have used various tools to help me ensure I know the keywords I am targeting (the words photographers are actually searching for) and that I am setting up those targeted words and phrases properly within my content so that I can rank higher in Google. Ultimately, my goal is to be #1 on the first page, but just getting to the first page is a huge accomplishment in my book. Do you want to see some results? I honed in on the keyword “photography copyright” based on results from my Google Keyword Tool research. The reason I chose this search term is because this is what people appear to be searching for when they are looking for information on the subject. You will notice in the image below that there were 4,400 global monthly searches for “photography copyright” which is a decent number for this particular subject area. Once I had picked my target search words, I then created an informative video that I placed on YouTube along with this post called Photography Copyright 101 and a free client copyright information card for photographers to use in their business. With the help of my WordPress SEO plugin, Yoast, I worked on using my targeted keywords in an optimized manner so that Google would rank me as high as possible when people were using the search term, photography copyright. In just a few short weeks, I was on the first page of Google, see below. But I also like to be able to look at the information behind the results and dig deeper. I used Market Samurai to dive into some of the other top results on the first page of Google for this search term. That image is below as well and as you can see, I was able to place on the first page for my targeted search words, even though there was some decent competition for the term (including the government website on copyright). These results are pretty cool, right? It’s really amazing what you can accomplish with some hard work. I will admit, SEO work isn’t always the easiest. It is time consuming and the payoff or the results don’t often come quickly. It can take months to rank higher on Google. But the thing is, if you are following good advice and you commit to doing the work, you WILL see results. It’s sort of like dieting and working out…perseverance gets you to your goal. How can you get great SEO results for your business? One of the things I found challenging about working on SEO was all of the research I had to do just to learn about SEO. There is a ton of information out there and it’s time consuming and difficult to collect it all. Plus, I wasn’t always sure the information I was reading was GOOD information. SEO has changed so much in just the past year alone, due to new Google algorithms. I needed to make sure the information I was following was current. My friend Zach Prez is an SEO expert, and he is one of the best. Zach Prez has saved the day for photographers!! 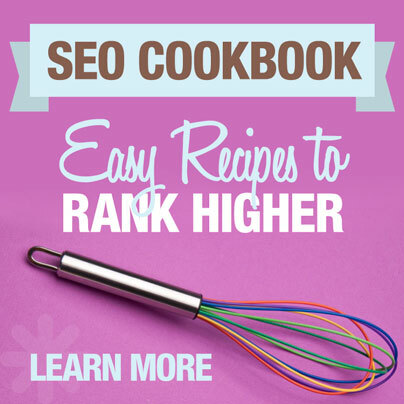 He just launched his new eBook SEO COOKBOOK – Easy Recipes to Rank Higher which I was lucky enough to get my hands on early…and I am completely floored! These SEO recipes in his book are the ones I am following! These SEO recipes helped me get to #1 on Google and to the first page on Google for various search terms. But I had to do hours, and hours, and hours of research to collect all of these SEO recipes that he so gracefully provides and explains in his new book. And since he is the expert, there is information in his book that is even new to me!! Seriously, his new book is so straight forward that anyone can take these SEO recipes — implement them and see results. I can tell you first hand, that if you do this stuff, you will rank higher! And if you rank higher, more people will find you, which means you have a bigger pool of prospective clients, which means you have the opportunity to find YOUR clients more easily, and make MORE money! Better clients and more money, who doesn’t want that?!? Here is an example of some of the information you will find in the SEO COOKBOOK on the Photography Spark Website. For a limited time Zach’s SEO Cookbook is $79 (regularly $99). Plus you get special bonus videos where Zach holds your hand and leads you step-by-step through various SEO tweaks for your website and blog. Hummm…$79 that could VERY realistically lead you to 10 new portrait clients or 10 new wedding clients and make you thousands and thousands more in sales this year. That’s a no brainer to me…especially since I spent 80 hours of my precious time trying to figure out all this SEO stuff that he so nicely organizes and explains in plain english. I would have gladly forked over $500 for the valuable information in Zach’s book! If you are a professional photographer and haven’t been taking SEO seriously, you need to re-think things. Today, most clients are finding their photographers online. Sure, there is definitely some word of mouth marketing going on… But you can’t solely rely on word of mouth marketing for your photography business. You need to take control and make sure that when somebody goes to Google (the most used search engine) or YouTube (the second most used search engine) they find you! Click Here to see my Video Review of SEO Cookbook for Photographers on YouTube. Note: Some of the links above are affiliate links. If you use an affiliate link to purchase a product or service, I may receive a small percentage as a commission. Your purchase will not cost you more in anyway. Thank you for your support, your contributions help keep the NKR content super valuable for your business.